to Equatorial Plants, a company that has been providing orchid species for beginners, specialists, commercial Nurseries and Botanical Gardens for over 40 years. If you are just starting with orchids, we can recommend plants suitable for window sill or for conservatory growing. If you are an experienced grower, we may have that special species you have been looking for on our lists. And if you are a nursery, we can provide flasks in commercial quantities. Dendrobium brassii T.M.Reeve & P. Woods has an interesting pedigree. 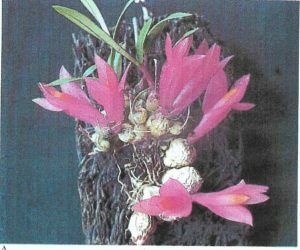 Firstly it is rare and like many rarer species, it was first assumed to be a natural hybrid between Dendrobium violaceum (whose flowers are similar) and Dendrobium petiolatum (which has similar globose pseudobulbs.) But natural hybrids within Dendrobium section Oxyglossum seldom occur and since one putative parent (D. petiolatum) had only been recorded once in the same region as Dendrobium violaceum, Tom Reeve and Paddy Woods decided that the three similar collections from three different localities amounted to a new species. Dendrobium brassii was described in 1989 from the first collection by C.E. Carr found in 1935 – only a few months before Carr died from Blackwater fever. Carr worked with a Tamil assistant called Mayandy and when it came to naming this new species, neither Carr nor Mayandi could be honoured since both specific epithets had already been used (Dendrobium carrii and Dendrobium mayandii respectively.) So L.J. Brass, a prolific collector in New Guinea received the honour. Brass (1900 – 1971) led five of the Archbold collecting expeditions between 1934 and 1957, some of which were sponsored by the Arnold Arboretum, which received much of their spoils. The collections from trip 5 in 1956 were received by Leiden Botanic Garden. Dendropbium brassii is a compact, tufted epiphyte found on Nothofagus (Southern Beech) trees from 1500-2200 metres altitude. The white roots have characteristic orange tips. It has one or a pair of petiolate leaves, 15 cm. x 1.2 cm. arising from globose pseudobulbs which have a slight constriction or waist at the mid point. The fibrous remains of the leaf bases are quite distinctive but not as pronounced as in Dendrobium petiolatum. Inflorescences arise on the leafless pseudobulbs and are generally two-flowered, pink to violet coloured and very long lasting – up to six months – and the plant may be in flower continuously. The seedlings available from Equatorial Plants were raised from Paddy Woods’ collection 2599 which had been growing at the Royal Botanic Garden, Edinburgh since 1968 – it grew slowly there and took time to flower. As is often the case, seedlings seem more willing to grow and flower and pose fewer problems in cultivation. Plants grow best on cork or tree fern plaques with some moss around their roots, humid, moist and well drained in good light and some air movement.